Dr. Bhaskar Telang is the Medical Director of NMC Medical Centre, Sharjah and has been practising as a General Practitioner in the UAE for over 26 years. He ably manages emergency cases and routine cases. He is experienced in family medicine and visited various Oil& Gas installations (offshore & onshore) as Medical Officer. 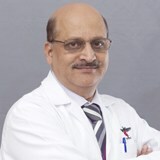 Dr. Bhaskar can speak English, Hindi, Kannada, Malayalam and Marathi.